Over-Stocked and Priced to Sell! 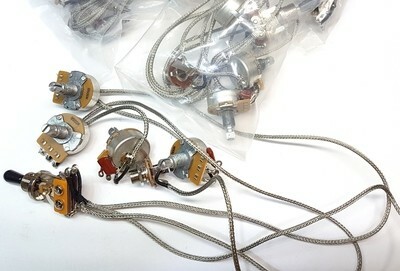 South Korean Made Full LP ( Les Paul ) Style Harness. Use it for your 2 Volume 2 Tone guitar configuration or if you need less, snip off or un-solder what you don't need. All pre-soldered for your convenience. We use metal mesh harness wire for your secure RW blocking leaving a nice clean tone.